This page will lead into some realtime projects so I can show how a project evolves over time and see the progression of problems and solutions. 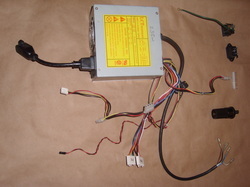 The 1st project will be the Bench Power Supply mentioned in other parts of this web site. It is ideal in that it is simple for most beginners, open ended and highly customizable. Good for a long term how to. 1. Bench Supply from old AT Power Supply with mods. 2. Car & USB using any computer supply or the Bench Supply above. Very quick and easy beginners project.